.when was the last time the stones put out a brand spanking new album ? archaeologists on crack have no place here. Bob Dylan still makes new music and put's out albums .when was the last time the stones put out a brand spanking new album ? (two songs(GRRR) on a NEW greatest hits album does not cut it) a bigger band sept 2005 .quite a long time . so to me it is funny how people keep saying the stones are putting out a new album next year . It's OK with me if you laugh right up until the day of it's release. No there's nothing wrong with. I like it both fast and slow. Hyde Park sounds like a train running out of steam...sorry. SWING is the key, right, but that went with Bill leaving. What did Dylan say.... they are a funk band now. But - is that supposed to be such a bad thing? In Dylanese I suppose it is..
Dylan sounds like Yoda doing karaoke these days. Yes, there will be a new album next year. Mick and Keith are as "Thick As Thieves" these days! I can imagine that they will record some new tracks in the next one or two years and maybe do a new album. But nothing´s sure yet. It would be one of the greatest things ever to get another new album from the Stones. But that´s another discussion. Yes, we will have plenty to discuss once they hit the studio up until the time it's released. The tragedy obviously set the schedule for recording back a bit. I am guessing they would have done something right after the coming Euro tour. Now it looks like the earliest they will record is sometime in 2015. Either before or after South America. Nice that this is even a possibility...things seemed pretty dire just a couple of years ago. Found this image on the japanese Stones page Hot Stuff. The rehearsal studio seems to be different than Paris (much smaller). BUT this site is in Japanese only, so good luck !! So the picture is from the rehearsels? Or did anybody seen this picture before? "A little insight into what kind of day ive had". 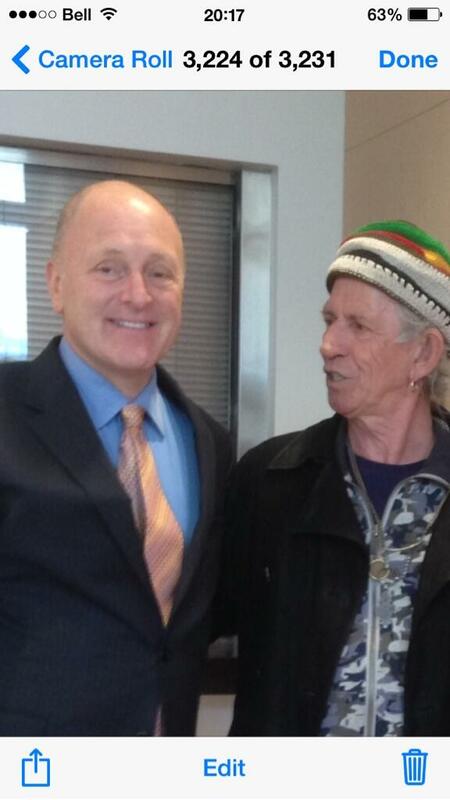 Never saw Keith with this Rasta "thing"
Man, that's an explosion! Thanks for all the pictures! Great to see the guys again - and Keith's raggae cap is just awesome! But I hope to see Mick is in a good state now soon. Edited 1 time(s). Last edit at 2014-05-15 20:53 by Kaisan. I hope he hasn't gotten rid of that pink suit! By the way, Mick better put his wig on. The boys back in action. Great!!! Probably Leah & the rest who are sharing these pics are informed - or do that out of respect - to not spread Jagger photos in the net now. Edited 1 time(s). Last edit at 2014-05-15 21:36 by Doxa. Bust as far as the point of this thread goes, those pics tell everything we need to know! who is the lady that Keith is kissing her hand ?